With its non-compromising position, a true cliff hanger, this unique North Cyprus Villa offers the ultimate lifestyle in terms of privacy, panoramic views all over the northern coastline and beyond. Ultra Modern Villa in Lapta set on a clifftop - Panoramic Views from Villa overlooking forests and out to Sea. Completion Estimated Time:	6-8 Months. Number of Floors: 3 Floors. 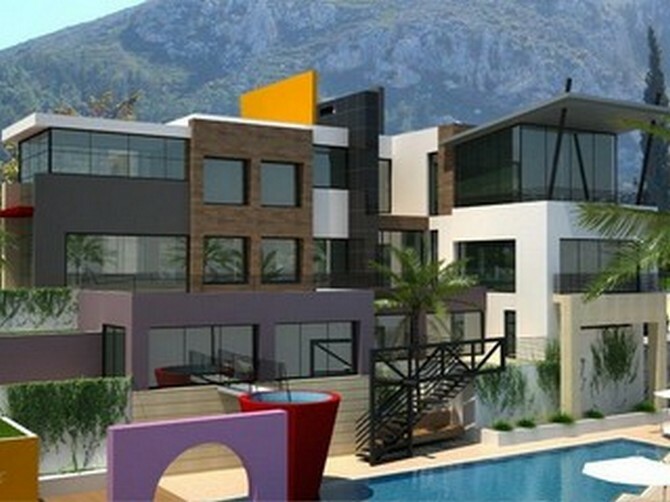 Total open area (Terraces): 500m2 (200m2 balconies+300m2 pool terrace. Swimming Pool: 130 m2 with 300m2 deck terraces. Construction	: Concrete, Steel and Glass. 130 m2 Swimming Pool with Pool bar. All Flooring is travertine marble + Fish and Water Lilly Pool with a sitting area next to it + drive way and open parking area for 8 cars + A room for house keeper with A/C + Shower + bedroom + 40 KWA Generator + fully landscaped gardens with irregation system + remote controlled gates + 1st quality local yellow stone baundry walls + 2 Ovens + Water well + 25 Tons Underground Water Tanks + Rose garden with sitting benches + Grape, banana, Lemon, Orange, etc.. Trees and 5 Date Trees + WI-FI. 4 Car Garages with remote control. (Garages has access into the house) + Laundry Room + Central heating System (Radiotors) + Suspended ceilings + 1 bedroom with Shower + Toilet + Sink and A/C Unit + Landing to the Glass lift and glass step staircase + Storage room + Library + A Large Shower Room with sky window + Sauna + 80m2 Gym with access to JACUZZI and Terrace + 44000BTU A/C and with spectecular views. 1 Leisure room + Suspended Ceilings + Decked A/C Units (Heating and Cooling) + Satellite System + Stereo System + WI-FI. *** All the materials will be top quality for this specific property.